The video playlist (above) features just about every version of the game you care to mention, and there's even a review of the board game (distributed by Milton Bradley in 1982) - plenty to keep you amused for a while, at least! The screenshot (left) is from the superior arcade version which was released by Sega in 1982. 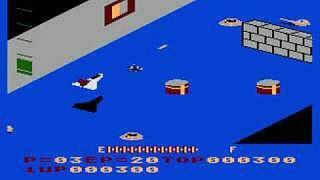 This game was very exciting at the time due the use of simulated 3D graphics from a third person viewpoint. It also featured shadows, which was extremely rare in the early 80s. 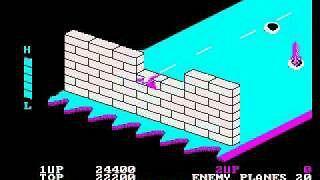 The game used a type of Axonometric Projection (the name Zaxxon was derived from Axonometric) called Isometric Projection. However, the Atari 2600 and Intellivision versions were displayed in a standard 3D mode, and this was most likely because these machines weren't technically capable of running the game with Isometric projection. I suspect that there is a programmer out there who may have disproved this theory, though, as there is an unofficial version of the game on a Radioshack TRS-80 computer (see the playlist above) which is quite a feat. Zaxxon was available for most home computers and consoles and proved to be extremely popular. A sequel, Super Zaxxon, was also released in 1983, but didn't go down as well as it proved to be rather too difficult to play - at least, it was on my Atari 800XL. The original Zaxxon looked very impressive on my Atari 800XL, but I always found it frustratingly difficult to play as it was very hard to judge what altitude you were flying at! I remember playing this in 1984 on my Atari 800XL with a school friend (it was my final year in school) and he was absolutely gobsmacked by the graphics, more particularly so because he owned a ZX Spectrum. The Speccy version was, unfortunately, not very well executed and probably one of the worst of all the versions available. I really enjoyed playing Zaxxon, but as I mentioned above, I was terrible at judging the height of the spacecraft. However, with a lot of practice I found myself completing the levels more easily. The sign of a good game is one you keep going back to (despite your frustrations! 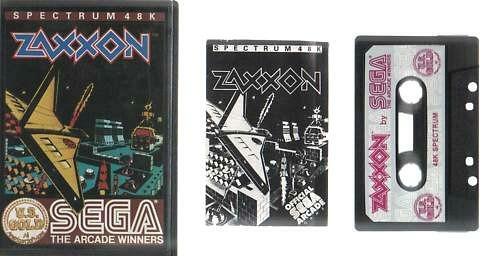 ), and as 80s computer games go, Zaxxon was certainly one of the best of the decade. Graphically, this version appears to be more appealing than the Atari XL/XE version, although the Atari version is definitely quicker due to its slightly faster CPU. Of course, I'm at risk here of reigniting the old rivalry between the two machine's users! Well, I quite like the colourful graphics, sound effects and music in the MSX version, but it's just a shame that the scrolling was so juddery (this problem also exists in the Coleco/Colecovision version), otherwise this had the potential to be the best version of all. Screenshot of the PC Dos version. Especially playable if you're a fan of turquoise and pink! Now, I wish I'd had one of these! This is the Sega Coleco Zaxxon table top mini arcade game which was launched in 1982. 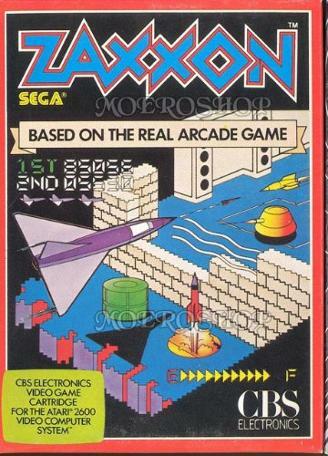 Personally, I found the original Zaxxon game far better than this sequel which was released in 1985 by US Gold. 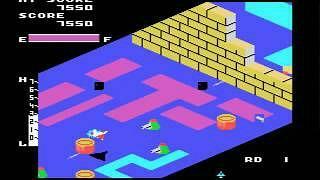 The Atari XL/XE version featured ghastly colours and very difficult gameplay. However, the shadow effects are quite decent. I remember the excitement of seeing the tantalising inlay card, which lead me to buy this on cassette as a treat during my first year in work - I kind of wish I hadn't bothered! 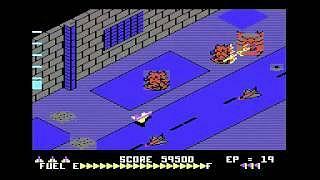 The C64 graphics certainly look more appealing.